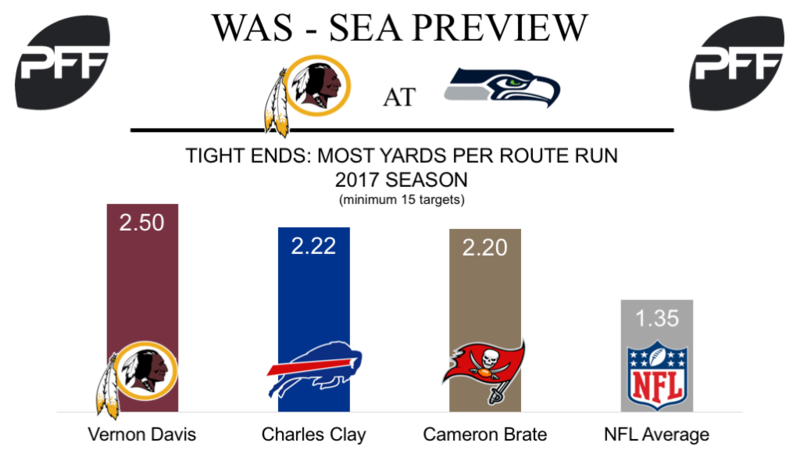 TE Vernon Davis vs. S Kam Chancellor – With Pro Bowl tight end Jordan Reed struggling through injury, Davis has stepped up and produced in a big way for the team during the first half of the season. Through eight weeks, Davis has been targeted 22 times, amassed 312 receiving yards and currently ranks first among tight ends with an average of 2.50 yards per route run. This Sunday, he’ll be trying to get the better of Kam Chancellor, whose coverage grade of 86.4 is currently 11th best among safeties. Through eight weeks, Chancellor has allowed just eight receptions and a passer rating of just 42.5 on the 17 targets he’s faced against tight ends this season. T T.J. Clemmings vs. Edge Dwight Freeney – The Washington offensive line has been absolutely desecrated with injuries over the last few weeks, and the team is now set to enter the game with just two of their starting offensive linemen. They’ll likely feel this most at left tackle, where perennial pro-bowler Trent Williams (80.0 pass-blocking grade) will be replaced by T.J. Clemmings (39.1 pass-blocking grade). Clemmings is coming off a brutal few seasons, and has allowed 113 pressures on his 1115 pass-blocking snaps since 2015, the third most among tackles. To compare, Williams has only surrendered 43 on his 1188 snaps since 2015. Freeney, who’s set to feature in his second game for the Seahawks, can look to take advantage of this matchup. The 16th year pass-rusher proved that he still has gas left in the tank in his first game with the team last week, after he produced a sack and a hurry on his 16 pass-rush snaps. RB Chris Thompson vs. LB Bobby Wagner – Through the first half of the season, the fifth-year running back has easily been Washington’s most productive weapon, and leads his team in receptions (31), receiving yards (442), and touchdowns (5). Through eight weeks, he ranks first among running backs with an average of 2.95 yards per route run, and when targeting him, quarterback Kirk Cousins has posted a passer rating of 130.5, the best mark among backs with at least 25 targets. On Sunday, he’ll be going up against Bobby Wagner, who currently owns the highest coverage grade among linebackers (92.7) and has allowed just 0.68 yards per coverage snap this season, fifth best among players at the position. Furthermore, Wagner hasn’t missed a tackle while in coverage since Week 9 of the 2016 season. Wagner has missed two days of practice this week however, so it’ll be worth monitoring to see if he plays and to see if he is hampered on the field. T Duane Brown vs. Edge Preston Smith – After previous left tackle Rees Odhiambo gave up four or more quarterback pressures in five out of seven weeks, Seattle went out and got left tackle Duane Brown at the deadline. 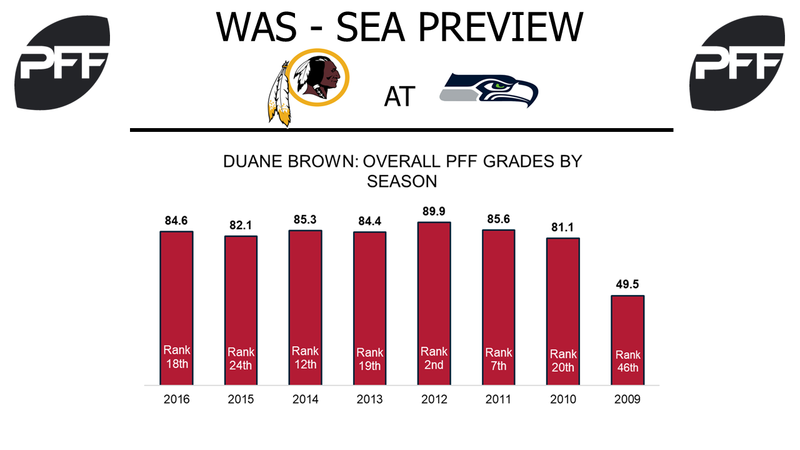 Brown has not graded out under 81.1 since his second year in the league in 2009 when he finished at 75.5. In his one game this season, Brown allowed two quarterback pressures against his new team in Week 8. Since 2010, Brown has been in the top-14 among the league’s tackles in least amount of pressures allowed over the course of the entire season, with 32 being the most allowed in a season over that time. Meanwhile, the Seahawks have not had a tackle other than Russell Okung allow less than 39 in a season since 2013. His first test will come against Preston Smith, who has generated 16 of his 19 pressures from the right side and has three or more quarterback pressures in three of his last four games and the 15th highest pass-rush productivity among 3-4 outside linebackers this season at 10.5. RB Eddie Lacy vs. Washington Run Defense – After Week 1, Eddie Lacy had eight straight games of forcing a missed tackle in the run game, tied for second longest streak of his career since entering the league in 2013. He was unable to force a single missed tackle in two games this season, with Week 8 being the second time he was unable to, against a team that was fifth in missed tackle percentage at 14.4. He will now face a Washington defense that is sixth in that category at 14.2 percent and have combined for 51 missed tackles on 307 attempts. Seahawks Right Outside Receivers vs. CB Josh Norman – Seattle has no receiver line up at right outside wide receiver more than 33 percent of the time and with Josh Norman playing 141 of his 153 snaps on the left side, it will be important to watch how keeping Norman on his toes with different receivers all day will affect him. Both Doug Baldwin and Paul Richardson have passer ratings above 100.0 when targeted while lined up outside to the right, with Baldwin’s at 100.5 and Richardson’s at 157.9, respectively. Norman has not allowed a touchdown over his last 11 games and in that span, has allowed 25 receptions on 40 targets with nine passes defended and two interceptions.